This herbaceous perennial British Columbia native produces basal leaves and tall flowering stems from mid spring to mid summer. The flowers start white and turn pink with age. 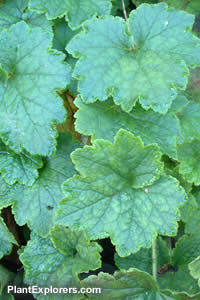 The leaves remain evergreen in mild winters and the plant spreads enthusiastically to form a dense ground cover. Height to 32 inches; spread 12 inches. Easy to grow from seed, and it will out-compete many weeds. For maximum freshness, please keep seed refrigerated in its original packaging until it is time to plant. Sow seed in containers in a cold frame in spring or as soon as ripe. Grow in full shade to part sun in humusy, moist soil.